Author’s note: In my Global Environmental Interactions class, we learned a lot about nitrogen and phosphorous as essential elements, but also as sources of eutrophication which threatens life in the ocean by disrupting food chains and causing anoxia. I decided to write a paper about the potential for microalgae to be cultivated as a way to remove those nutrient inputs from the water before it reaches the ocean, changing their role from the source of eutrophication to a possible solution. While nitrogen and phosphorus are an important supply of nutrients that feed the marine food chain, excessive inputs can cause eutrophication, a condition in which the water becomes too enriched with these nutrients. As more nitrogen and phosphorus enter the ecosystem from agricultural, industrial, and municipal runoff, the natural food chain can not keep up with the growth of phytoplankton and algae that result. These organisms consume the nutrients and their populations multiply, creating a layer of algae above the water that blocks light from the organisms below (Mee 2006, Diaz et al. 2008). Eventually, these organisms die and bacteria consume oxygen to break them down, in many cases causing oxygen exhaustion and resulting in dead zones (Mee 2006). 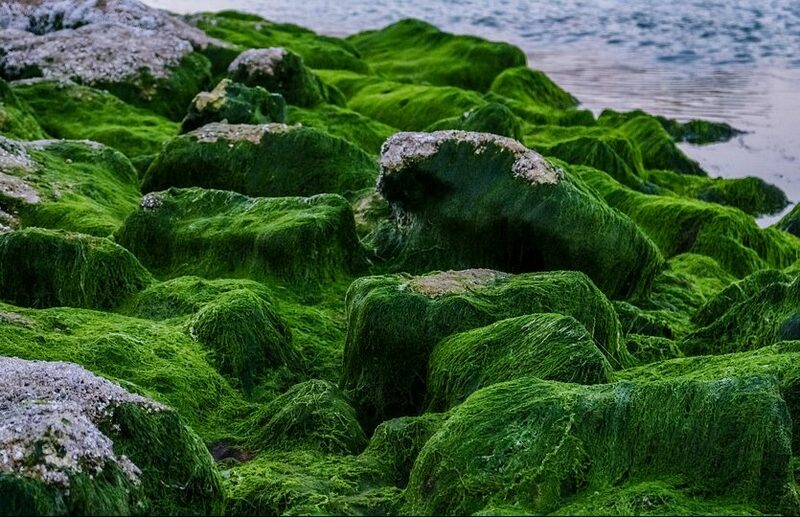 Though overproduction of algae in the ocean due to eutrophication can harm the balance of ecosystems, in a controlled environment they can be a valuable tool if used as wastewater treatment and potentially used as raw material to make biofuel. Nitrogen and phosphorus support algae growth, making algae a viable resource for wastewater treatment seeking to reduce concentrations of these nutrients in runoff. A common treatment for wastewater chemically produces sludge as a byproduct, removing much of the nitrogen and phosphorus from the water so it does not cause eutrophication downstream, but the phosphorus precipitate that results is typically disposed of in landfills or used to create sludge fertilizer (Pittman et al. 2011). Microalgae perform a similar function without the use of chemical treatment, providing a practical option to remove heavy metals, nitrogen, and phosphorus from wastewater without producing a sludge byproduct (Cai et al. 2013). Due to the high nitrogen and phosphorus concentrations in agricultural runoff from fertilizers and manure, algae productivity in this kind of wastewater effectively removes the excess nutrients. If cultivated in High Rate Algal Ponds (HRAPs), microalgae can both treat wastewater and be a source of biofuel. The algae grown in wastewater treatment processes can be extracted and used as feedstock for fuel through anaerobic respiration for biogas, lipids to biofuel, or carbohydrate fermentation to bioethanol. This option is attractive for its reuse of resources: HRAP systems which exclusively cultivate feedstock for biofuel are more costly and resource intensive than land-based biofuel sources, however, if combined with wastewater treatment, nutrients and water that would otherwise be wasted can be put to use (Park et al. 2011). Pittman et al. refer to a species of Chlorella grown in a municipal wastewater oxidation pond in India to demonstrate the effect that additional nutrient inputs have on biomass. Acting as a photoheterotroph, the algae produced a biomass of 379 mg/L after 10 days, compared to 73.03 mg/L as a photoautotroph (Pittman et al. 2011). This suggests that in a HRAP system, algae could be a viable source of biomass production. Additionally, high CO2 content produces greater biomass. If anaerobic digestion produces biogas on site, the exhaust from that energy generation could be used as a CO2 input, making the system up to two times more productive with proper amounts of CO2 (Park et al. 2011). While a number of other factors contribute to algal biomass production including algal species, pH of the water, light saturation, lipid production, and nutrient availability, with proper design, experimentation, and implementation, these parameters can be addressed. When cultivated in partnership with wastewater treatment, algae can be a feedstock source for biogas, simultaneously providing sustainable energy and reducing the effects of eutrophication. Though more research is needed to determine the practicality of joint wastewater-biogas projects, many high-rate algal ponds are currently used on a small-scale for water treatment, particularly in small communities (Park et al. 2011). Potential lies within using the algae grown as a fuel source, which would reduce water and arable land used currently to grow soy and corn for bio-ethanol, and reduce the effects of eutrophication by consuming nitrogen and phosphorous before it reaches the ocean. Microalgae: Status and Prospects.” Renewable and Sustainable Energy Reviews, vol. 19, 2013, pp. 360–369., doi:10.1016/j.rser.2012.11.030. Marine Organisms.” Science, vol. 321, 2008, pp. 926-929., doi:10.1126/science.1156401. Mee, L. “Reviving Dead Zones.” Scientific American, 2006, pp. 80-85. Biofuel Production Using Wastewater Resources.” Bioresource Technology, vol. 102, no. 1, 2011, pp. 17–25., doi:10.1016/j.biortech.2010.06.035.